Before the war's inception, efforts to control fur trade access resulted in a series of escalating incidents and attacks that increased tensions on both sides. Political divisions between the Pequot and Mohegan widened as they aligned with different trade sources-- the Mohegan with the Puritan English, and the Pequot with the Dutch. The Pequot attacked a group of Mattabesic Indians who had attempted to trade at Hartford. Tension also increased as Massachusetts Bay Colony began to manufacture wampum, the supply of which the Pequot had controlled up until 1633. In 1634, John Stone, a smuggler, privateer, and slaver, and seven of his crewmen were killed by the Western Niantic, tributary clients of the Pequot, in retaliation for atrocities committed by the Dutch, and more recently, by Stone. A principal Pequot Sachem, Tatobem, had boarded a Dutch vessel to trade. Instead of conducting trade, the Dutch seized the Sachem and demanded a substantial ransom for his safe return. The Pequot quickly sent a bushel of wampum, and received Tatobem's corpse in return. Stone, the privateer, was actually from the West Indies and had been banished from Boston for malfeasance. Setting sail from Boston, Stone had met his end near the mouth of the Connecticut River while kidnapping Western Niantic women and children to sell as slaves in Virginia Colony. Colonial officials in Boston protested the killing. The Pequot Sachem, Sassacus, refused the colonials' demands that the Western Niantic responsible for Stone's death be turned over to them. Then on July 20, 1636, a respected trader named John Oldham was attacked on a trading voyage to Block Island. He and several of his crew were killed and his ship looted by Narragansett-allied Indians who sought to discourage English settlers from trading with their Pequot rivals. In the weeks that followed, colonial officials from Massachusetts Bay, Rhode Island, and Connecticut, assumed the Narragansett were the likely culprits. Knowing that the Indians of Block Island were allies of the Eastern Niantic, who in turn were allied with the Narragansett, Puritan officials became equally suspicious of the Narragansett. Even so, the colonial English response to Oldham's death, the last in a series of escalating incidents, has traditionally been viewed as the beginning of the Pequot War. 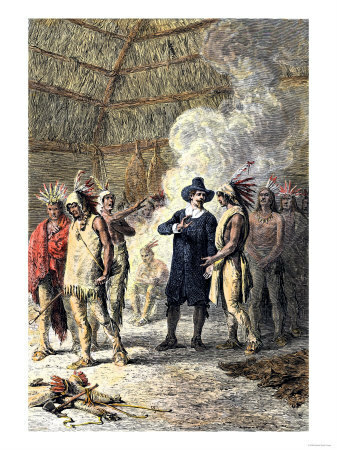 In 1634 the the Pequots initiated peace negotiations with the Massachusetts Bay Colony. They wanted the English to re-establish trade and arbitrate a peace settlement with the Narragansetts. The Bay Colony responded with demands for exhorbinant tribute (1000 fathoms of wampum) and the surrender of the killers, something the Pequots were not prepared to do.